An open letter from survivors of gun violence and the families of victims. Survivors and families of victims of gun violence, alongside engineering students, call on Ottawa to ban assault weapons. The sorry spectacle of pro-gun interests hijacking the legislative process surrounding Bill C-71 would make the NRA proud. Never did we expect to see the gun lobby's agenda so pervasively influence the deliberations of the Commons Committee charged with reviewing the Liberal's proposed gun control legislation. As the hearings come to an end, survivors of gun violence and families of victims cannot help but feel a bitter sense of betrayal by a system that is supposed to protect Canadians from preventable gun injury and death. Not only is C-71 devoid of any bold measures to combat the upward trends of gun-related crime, homicides and suicides, it barely fulfills Liberal election promises and doesn't come close to repairing the damage inflicted on our gun laws by the Harper government — damage that Prime Minister Justin Trudeau vehemently criticized while in opposition. The right of all Canadians to be safe from gun violence was continually overshadowed. Take for instance the promise to "repeal" the 2015 changes in Bill C-42 that allow owners to transport restricted weapons virtually anywhere in their province (that is, to and from ANY gun club, shooting range, gun business, port of entry/exit and police station). Bill C-71 only narrows the list of trajectories that are automatically authorized to "gun clubs or shooting ranges," which covers 96 per cent of all transport purposes, according to officials. In other words, the bill fails to reinstate the previous authorization to transport (ATT) which specified each place a handgun may be transported to, like the actual gun club of which its owner is a member. The proposed legislation nonetheless represents a step in the right direction, by reinstating commercial sales records and requiring sellers to validate a potential buyer's license. So when we testified before the Standing Committee on Public Safety last May, we supported the bill and counted on the Liberal and NDP members to introduce amendments in accordance with the recommendations of violence and suicide prevention experts. But apart from Liberal MP Pam Damoff (who, hats off to her, tabled and skillfully defended an amendment improving the screening process), most of what we heard consisted of Conservative MPs proposing amendment after amendment aimed at weakening the bill, with government bureaucrats painstakingly explaining the principles and intricacies of the law in response. The right of all Canadians to be safe from gun violence was continually overshadowed by the apparently supremely critical importance of not letting one single gun owner get "caught up in a background check" and lose their license. Isn't this the whole point of gun ownership being a privilege and not a right in Canada? That a reasonable assessment of a risk to public safety based on past violent or suicidal behaviour, independent of whether the applicant has a criminal record, is sufficient grounds to prevent an individual from owning guns? You know, to err on the side of caution? This is what the overwhelming majority of Canadians believe and expect. 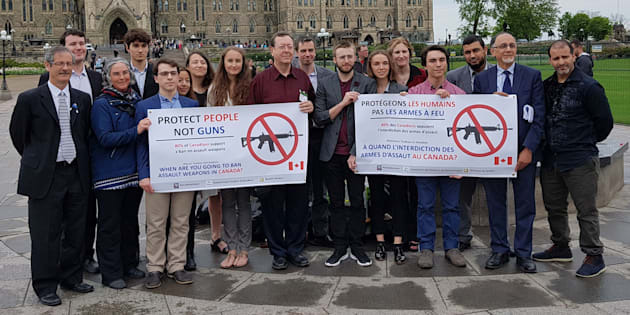 Yet the entire political process — from speeches in House of Commons to debates in the media to the parliamentary hearings — was predominantly focused on how the law would affect "law-abiding gun owners." Each measure (and each amendment) was subject to a barrage of questions and criticisms from the perspective of hunters, target shooters, collectors and businesses. Even the notion of making a phone call to validate a buyer's license was considered a major cause for concern! And what about semi-automatic, military-style assault weapons? Amid all this talk of "burdens" on gun owners, reflections on the human and financial costs of easy access to firearms were few and far between. And what about semi-automatic, military-style assault weapons? Unfortunately for the 80 per cent of Canadians who are opposed to their private ownership, the bill doesn't even address the issue of classification. Worse, the Trudeau government has so far been successful at dodging the very question of whether or not these weapons should be legal. In fact, in response to the Islamic Cultural Centre of Quebec City community's plea to ban assault weapons, Public Safety Minister Ralph Goodale, with a billion-dollar budget and scores of lawyers and bureaucrats at his disposal, lamented that such a ban would be "complicated" and require "a complete change of the classification system" — though he magnanimously offered to examine any legislative proposals provided by the victims of a massacre. Let's hope that our senators, who as appointed rather than elected members have no reason to fear a minority of vocal gun enthusiasts, will know to put the safety of Canadians first.